November is good for Permit plus more barracudas, sharks and jacks come onto the flats. Winter fishing can be explosive with lots of action from these species and more! Redfish have become more prominent in the Lower Keys too. 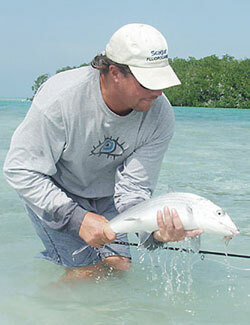 One of the most sought after fish that roam the waters off Key West is the Tarpon. Also known as the "Silver King," the tarpon can grow to over 200lbs. Most of the migrating fish that we see during the months of April through June are in the 70lb range. It's not to say you won't find one larger, but you will definately know that he is by the fight he gives you. 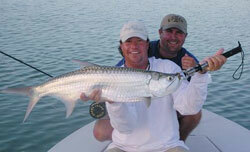 There are a few methods for tarpon fishing here in the Keys, it's up to you as to which one suits your style best. One of the easiest ways to get a tarpon to eat when they are being picky is to attempt to feed them a fly. There are so many patterns and colors that usually your guide can offer a few select choices to make your hook up more successful. During the early tarpon migration, the fish travel most of the ocean side flats and will come in large pods. Some will travel into the backcountry and will tend to stay on deeper flats and in channels. It is not uncommon to be able to hook these on fly and depending on the water color, an olive and black pattern had worked well in years past. Of course there are plenty that will work if you can get the fly to the fish. One thing you must remember about Tarpon is that they won't go out of their way too much to eat, so you have to get the fly to them and make sure to work it so they see it. Migrating tarpon are fun fish and often your guide will ask you to get up pretty early and get out to fish for rolling fish. These fish are pretty happy and preform a sort of "dance" by daisy chaining in a circle. Early morning is still a great time to fish for them but they can be found througout the day and even after dusk for a little night time tarpon fishing.